"But more than anything, Sammy and Sue want to learn to swim in the sea." This diminutive book effectively taps into kid rhythm with its lilting, letter-“S”-centric story about a brother and sister who visit relatives at the beach and dream of learning to swim. Ending each page is the soon-familiar refrain, “Sammy and Susie want to learn to swim in the sea.” Any conversational child worth her weight in giggles will join in the recitation before the book ends and may even continue chanting the refrain long after reading time ends. Children may not even notice how the book stuffs its sea-faring self with a solid stockpile of “S” words. There is a lot for parents and kids to enjoy here. The supersized “S” supply solidly supports pre-literacy awareness of letters, which is valuable to young children who are learning the alphabet and beginning to recognize the configuration of words on the page. The story also, on a simple, kid-appropriate level, creates a conflict that must be resolved. These kids want to swim! The seashore is great, there’s a lot to do, but they have a goal. They need a grownup’s help. They are motivated, adventurous, and excited to learn this new skill and engage more deeply with the joys of the beach. Small, memorable, sneakily educational books like this are often winners with little kids, so often adults cram books full of words and complex ideas, wanting to tell everything to captive little ears. But captive little ears don’t need intense narratives; they need a simple concept with short, happy, memorable bursts of language that they can access, understand, and enjoy. The smallest, most basic books can galvanize a young imagination. Give a kid the spark, and his mind will run with it. Illustrations are an important part of this equation. Sammy and Susie’s happy-faced, cartoonish images are simple but engaging, casting family beach days as whimsical and bright. Kids like looking at other children’s faces, and as Sammy and Susie smile out from among their beach toys, young readers perceive the characters’ enthusiasm. 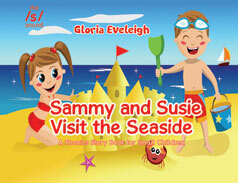 For children who may not yet have visited a beach or have been frightened by early visits, the visible pleasure Sammy and Susie take in their seaside escapades may have a positive effect on their feelings about the beach. Other positives may rub off on young readers as well. Learning to swim is a rite of passage in childhood, and it often launches with fear and skepticism from the child. But as young readers see Sammy and Susie’s happy faces and absorb the urgency with which this duo wants swim lessons, even the most water-resistant little landlubber might open her mind to the possibility that learning to swim could be a desirable and fun activity to undertake. Sammy and Susie want to learn to swim in the sea; maybe I can learn too!